I’ve decided to start doing short blog posts on special nail polishes or mini collections that I purchase from time to time. I won’t be doing a blog post on every single nail polish I own because that would probably be a whole year’s worth of blog posts! I’ve mentioned before that I love buying mini versions of things and the OPI / Essie mini collections are no exception. My first mini collection I want to show you, and this is probably some type of mini review too, is the ‘Oz The Great And Powerful’ collection that was released in the US a couple of months ago. I follow a few nail art blogs and as soon as I see an interesting collection coming out, I immediately pop on to eBay to see if I can get a mini collection for a reasonable price. The whole collection consists of 3 glitters, 3 sheer neutrals and 1 Liquid Sand polishes. The mini collection consists of the 3 sheer neutrals and the 1 Liquid Sand. I also purchased the full-sized versions of 2 of the glitters. Anyway, so below is the mini polish bottles in all their glory. I just think these miniature bottles are so cute! I have a photo on my Instagram of a miniature bottle compared to a full-sized OPI nail polish bottle, if you’d like to see the difference in size. 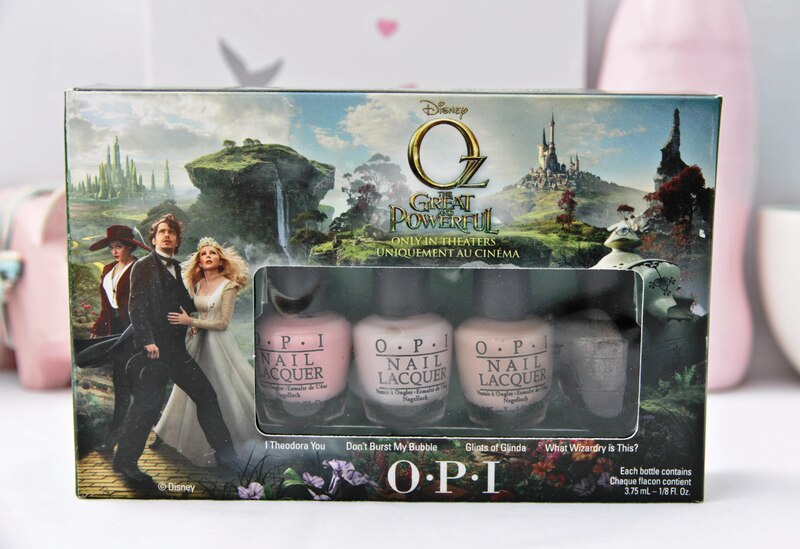 Each mini bottle contains 3.75ml, where a full-sized OPI bottle contains 15ml. This is a pretty, muted baby pink shade. It’s probably my favourite out of all the sheer ones, since it’s the most opaque. It’s not streaky at all and quite easy to apply. I am wearing this on one of my most recent Instagram photos. This is a sheer white shade with the tiniest bit of pink mixed into it. It reminds me of Essie’s Marshmallow with a tinge of pink because it has a similar jelly consistency. This one has a nice formula as well, not streaky but can be quite sheer. This is my least favourite shade, it reminds me of a pink nail polish that is so old, it has started to go yellow (I’ve had that happen before, so I know what it looks like). It’s more beige than yellow but still, I think it makes my nails look stained – not a cute look! The formula of this one is also good, no streaks but also quite sheer. This is my favourite one out of the whole mini collection – I’m really enjoying the OPI Liquid Sand formulas! It’s a brown and gold textured nail polish (once dried it almost looks and feels like sand paper on your nails). I only need 2 coats for full opacity and it dries to a matte finish quite quickly. One thing about the Liquid Sand nail polishes is you can leave it without a top coat for a matte look or you can use a top coat and it will look completely different! The swatches (2 coats each) are in order as pictured and mentioned above. I purchased the mini collection set on eBay for around R 170.00 ($ 17), including shipping. I like how you show the swatches. Keep them coming!